View of living room from front hall. Check out mid week availability in May. This warm and private, 1850's Nantucket Island half-Cape has every amenity a vacation rental home can offer. 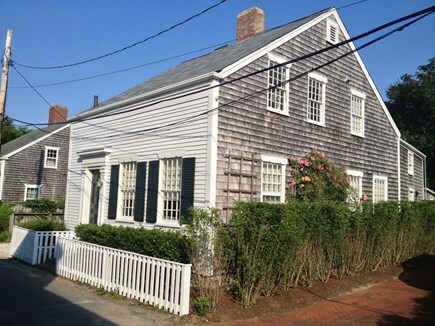 Located in the Old Historic District of Nantucket Town, it is situated on a quiet one-way lane just minutes from Main Street and convenient to all of the activities of the Island. The property offers off-street parking and a private fenced yard with patio. The home has three bedrooms and three baths, accommodating up to six people; living-room, dining room, gourmet kitchen; chef's pantry; and laundry/mud room. 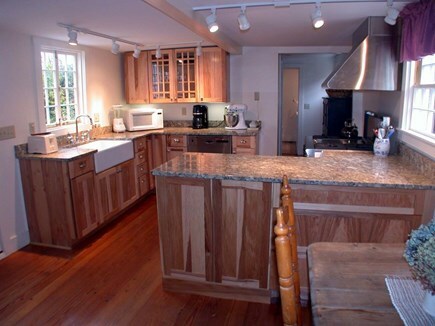 This 1850 antique half-Cape was completely renovated in 2004. The entire house is completely insulated. The house is heated with radiant heat. There is new plumbing and wiring throughout along with new interior walls. The gourmet kitchen has an antique heart pine floor, hickory cabinets, four burner with griddle gas dual fuel range and granite counters. Appliances are state-of-the-art. All three bedrooms are on the second floor (two queens and two twins). General Comments: Situated on a quiet one-way street with minimal traffic, this inviting home is tranquil and meets all of your living needs. Easy eight minute walk to Main Street. No public street parking and island shuttle bus stop is at end of Weymouth Street. 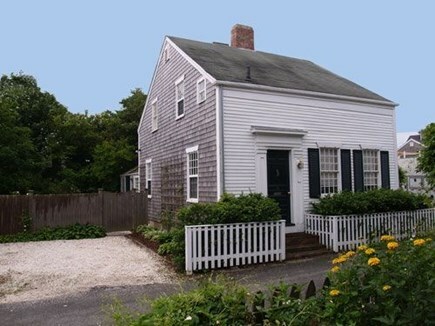 House Description: The house is a circa 1850 half-Cape. It was completely remodeled and updated in 2004. There are three full baths in the home; two new full baths, one on the first floor, one on the second floor, each with a shower and a remodeled full bath with tub on the second floor. 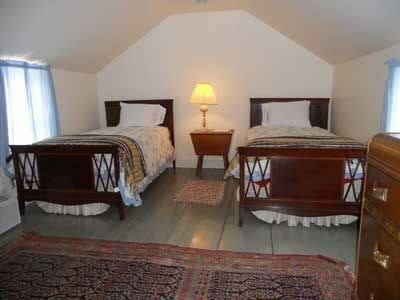 All three bedrooms are on the second floor: two queen sized and two twin beds. 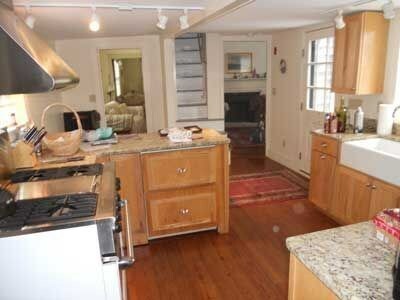 It has a state-of-the-art kitchen and is comfortable for a couple or a party of six. The patio has a private bricked in area with a gas grill. There is ample off-street parking for one car. Additional availability info: 7 night minimum from June 1 to Sept 28. There are open 2 and 3 day midweek blocks in Apr and May. This is a Saturday to Saturday vacation rental. Long-Term Rental (1 month or more): Not available. Additional pricing info: $200 cleaning fee. OFF-SEASON daily rate varies with number of occupants and nights rented. State and local taxes of 11.7% will apply. We had a fantastic fall getaway in Nantucket at Weymouth St, despite the fact that we arrived in heavy rain and, we now realize, we have no visual memory of our arrival-- it was raining too hard! Despite the rain, the house is so central and convenient, we were able to bike all over the island. When we weren't biking, we were walking into town for shopping, meals and the Whaling Museum. The house built in 1852 has retained its antique character. It is very comfortable and is equipped with a very modern kitchen with great appliances and a wonderful laundry. The yard is private and provides a lovely outdoor space. Lovely cottage walking distance to town! We had the pleasure of staying at this property last summer for two weeks and it was just fantastic. The best part... the back yard! We sat out there every day drinking wine or playing cards. It was private and quiet. Second best part... the distance to town! Whenever we wanted to go to town for ice cream, dinner, etc., it was just a 10 minute walk to wherever we wanted to go and no worrying about parking. My family has enjoyed multiple visits to this lovely and well located home. Updated kitchen, beautifully maintained garden, historical charm and owner's warm welcome make this a very comfortable home away from home. Location makes walking to town or visiting beaches easy. We have been big fans of biking to nearby Children's Beach or Jetties Beach. I have been renting out to vacationers since 1991. 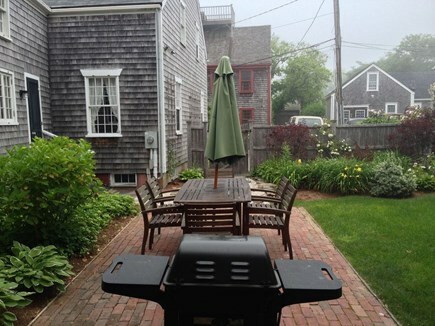 I understand the amenities needed by parties for an enjoyable stay in Nantucket. This house is a short walk of about eight or nine minutes to Main Street. You do not need a car to enjoy this house and the island. The shuttle bus is very inexpensive to use and will take you anywhere on the island. I have had scores of satisfied renters. I am on this website venue simply due to the fact that it more than adequately serves the vacation needs of those wishing to rent a Nantucket in-town house and want to avoid the booking fees charged by other vacation websites. You will find me to be reliable and easy to deal with in setting up your Nantucket rental. I look forward to assisting you in securing your Nantucket vacation rental, whether it is for a weekend or for a week or more. This home is an original 1850 half-Cape which represents the Old Nantucket in every sense integrated with amenities as to living comfort. It has been updated with all of the features you would expect in a vacation rental: gourmet kitchen, two new bathrooms (with showers) and a restored half-bath with tub, a quiet and private patio, retained architectural features such as wood plank floors and decoration consistent with its period. It is not “faux Nantucket”. Simply put, it is warm and cozy, inside and out, without the feeling of too much or too little house. It is the perfect fit. Our family loves it. Countless numbers of vacationers have shared this home with us as their vacation rental, many of which return year after year. Nothing compares to the unique beauty of Nantucket. It is like being in another world, yet only thirty miles off the New England coast. 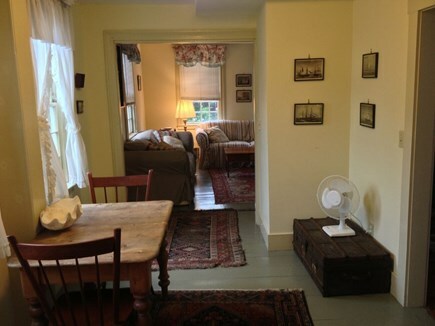 The house is just a short ten minute walk to Main Street and its abundant cultural attractions and social activities. It is two doors from the Nantucket Lightship Basket Museum.